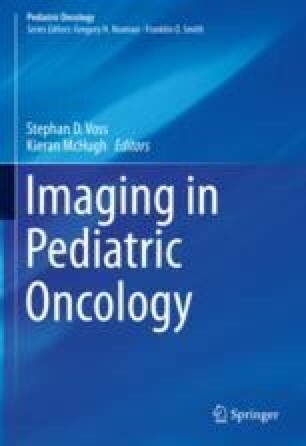 Oncologic imaging is most suited for functional imaging by MRI techniques like diffusion-weighted imaging (DWI) and dynamic contrast-enhanced (DCE) MRI. The dense cellularity of the cancer can be assessed by DWI. Similarly, most cancerous tissues have neoangiogenesis and are more vascular than normal tissues, which can be assessed using DCE-MRI. The majority of common body tumors in children demonstrate qualitative diffusion restriction that helps to differentiate between benign and malignant tumors. DWI also serves as an excellent detection sequence as most other tissues lose signal on DW images. Apparent diffusion coefficient (ADC) is a quantitative biomarker derived from DWI that can potentially be used to characterize tumors and monitor and assess therapy response. However, it is currently limited by variability and limited by reproducibility. Newer quantitative DWI assessment models like intravoxel incoherent motion (IVIM), diffusion kurtosis, and stretched-exponential models provide multiple other potential biomarkers for tumor assessment but still are in early investigational phase. Whole-body diffusion is being explored for staging of tumors especially lymphoma but is currently not sufficiently robust and has some limitations. DCE-MRI is a technique that evaluates the microstructural circulation of biological tissues and can be used to evaluate changes in the vascular environment of tumors following therapy with anti-angiogenic agents. While currently limited to a research and drug development setting, DCE-MRI has potential to allow earlier detection of tumor response and may prognosticate outcome in some tumors. Glade Bender JL, Lee A, Reid JM, Baruchel S, Roberts T, Voss SD, Wu B, Ahern CH, Ingle AM, Harris P, Weigel BJ, Blaney SM. Phase I pharmacokinetic and pharmacodynamic study of pazopanib in children with soft tissue sarcoma and other refractory solid tumors: a children’s oncology group phase I consortium report. J Clin Oncol. 2013;31:3034–43. https://doi.org/10.1200/JCO.2012.47.0914.